Plans to improve traffic flow, facilities and mobility within the park, as well as enhanced connections to and along the Erie Bayfront. Department of Transportation (PennDOT), Conservation and Natural Resources (DCNR), and Community and Economic Development (DCED) officials were onsite for a event July 6th, highlighting the collective state contribution to the project. PennDOT is beginning two initiatives in the area — a multimodal study within the park, the states most heavily visited with 4 million annual visits, as well as concept refinement and preliminary engineering for projects along Erie's Bayfront Parkway. "Transportation should help support community growth and opportunities, and these two improvement initiatives go to the heart of that goal," Secretary Leslie S. Richards said. "We're not only supporting safer and better mobility, but we're also complementing the efforts of our business partners." For the bayfront initiative, the department is developing projects growing from concepts in the recently completed Bayfront Parkway Feasibility Study, accessible at www.bayfrontparkwaystudy.com. The projects will enhance multimodal transportation access and accommodate development on Erie's Bayfront Parkway. The study examined the Bayfront Parkway from its link with West 12th Street to its link with East 12th Street. However, this first infusion of funds will focus on the central Bayfront – roughly the area from Water Works Drive to Holland Street. Short-term concepts in the study involve such things as intersection improvement options (including improved pedestrian and bike access) at the Bayfront Parkway and State Street; and intersection improvements at the Bayfront Parkway and Holland Street. Intermediate proposals include development of a new frontage road connecting to the Convention Center drive. Also, being refined are intersection improvements at East 12th Street, bus pull-off areas for transit users along the Bayfront Parkway, and traffic calming measures in the East 12th Street area. The initiative will help accommodate the private investment being made in developments now underway as well as those planned in the future, such as the expansion being planned by Erie Insurance and UPMC Hamot, as well as development such as Harbor Place and Bayfront Place. PennDOT's multimodal study within the park will evaluate potential improvements to enhance safety and reduce congestion. Options to be investigated include improvements to parking, bicycle/pedestrian trails, and reducing vehicular traffic congestion through investments in a multimodal hub potentially including water taxi service, bike rentals, parking, possible shuttle service at one key location. A traffic, safety, and parking study will be conducted as part of the study that is estimated to finish this fall. "Across our state park system, we are looking for ways to improve how people are accessing our parks and to eliminate transportation barriers that may exist," said DCNR Secretary Cindy Adams Dunn. 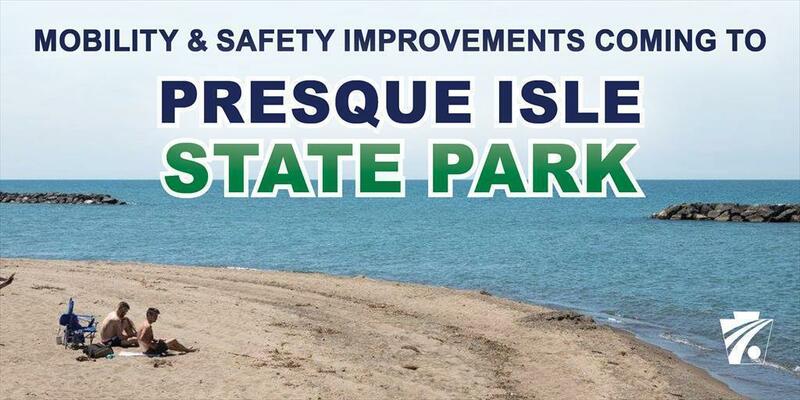 "Presque Isle is unique in that it also has a water access option, in addition to pedestrian, bicycle, and public transportation options. We will use this study to look at all these modes of transportation to see what enhancements can be made that best serve the needs of our visitors." Dunn added that the PennDOT multimodal study blends with DCNR's long-term strategy to enhance the facilities and visitor experiences at the park through upcoming projects that include upgrades at two of its seven beaches, sewage infrastructure enhancements, and rehabilitation of the historic Stull Interpretive Center. The sewage enhancements are in design and beach enhancements could begin in August. At the event, DCED Secretary Dennis Davin underscored transportation and tourism's critical link to successful, thriving communities. "The Bayfront area is ripe for economic development," said Secretary Davin. "These improvements will facilitate projects that will boost the local economy, create jobs, and further connect businesses and tourists from the rest of Pennsylvania and its surrounding states to Erie. I'm excited for what this will bring to the Erie Bayfront, and DCED will be working closely with area businesses in the future." Davin also noted that the coming initiatives complement state investments he announced in March​ that will support revitalization efforts in Erie. Information on all of Pennsylvania's state parks is available at www.dcnr.state.pa.us. For more information on this project and others, visit www.penndot.gov. Follow PennDOT on Facebook, Twitter, and Instagram.